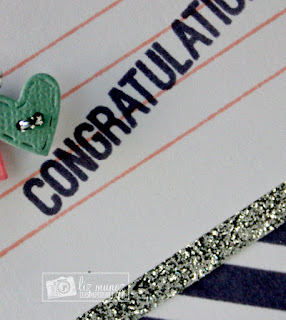 Liz's Paper Loft: MCT Thoughtful Thursday ~ congratulations! This card I made for my niece and her fiance's engagement party. I thought it would be fun to decorate like a postcard. 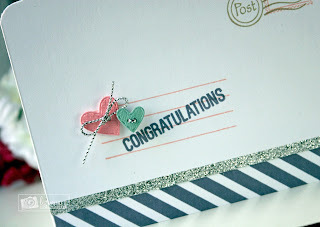 This card was super quick and easy to complete. I love that a simple card can still have a lot of impact. AWWWW your card is so sweet! I love your clever and creative ideas you are the Queen of Vintage and I love it! I just love too how super clever and creative you always are with Miss Emma's goodies! Thanks for the inspiration!! Super cute, Liz! I love all of the elements and the colors you used! 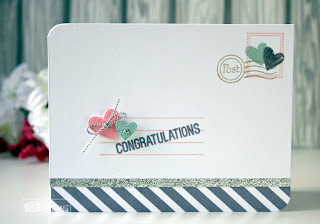 I really like the glitter strip and stripes stamped. I like the button hearts. Great idea to make it like a post card. Your niece will love her card. Liz ~ so BEAUTIFUL! I couldn't agree with you more ~ I bet they will LOVE this and cherish it forever! CONGRATS to them!